Louisiana is incredibly rich in lakes both natural and man-made that provide endless opportunity for water sports, fishing, boating, bird watching, and any other kind of outdoor recreation. 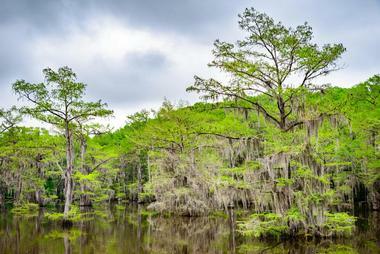 Most lakes are shallow and surrounded by picturesque moss-covered southern cypress trees with their roots in the water. Nearby national parks or conservation lands protect many of the lakes because of their unique and often fragile ecosystems. Caddo Lake, located an hour's drive from Shreveport, is divided between Texas and Louisiana. This lovely freshwater lake contains the world’s biggest Cypress forest. 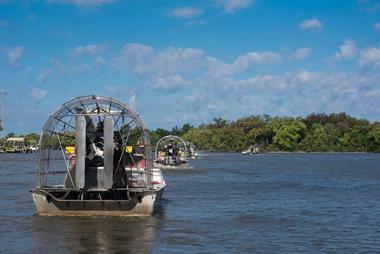 The boat traffic is much livelier on the Louisiana side where the waters are deeper, at times up to 20 feet. The Texas side is much shallower, with areas that are less than five feet. The lake has a number of huge Cypress trees covered in Spanish moss, as well as many narrow waterways and canals (both marked and unmarked) and small green islands. It is lovely to explore in a kayak or in a flat-bottomed boat. The lake is home to more than 71 species of fish and is very popular among anglers who come for trophy largemouth bass, catfish, white bass, and many others. 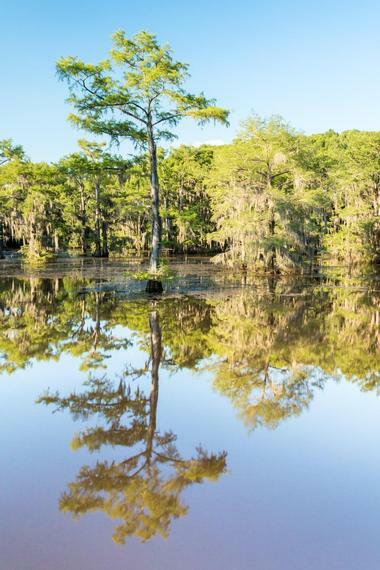 Lake Martin is one of Louisiana's major swamplands and a designated wildlife preserve. 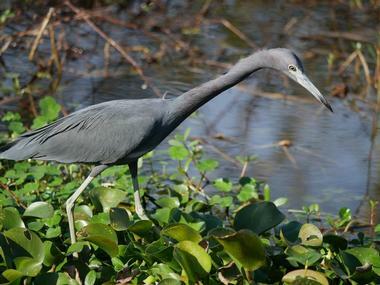 Located just outside of Breaux Bridge in St. Martin Parish, the swamplands are intersected with several hiking and biking trails that offer an opportunity to see animals such as egrets, herons, herons, ibis, alligators, bullfrogs, cottonmouths, and nutrias. Lake Martin can be easily accessed by car and explored on foot, in a canoe, or by kayak. The lake is part of the Cypress Island Nature Preserve and is owned and managed by the Nature Conservancy. The organization is in charge of keeping the preserve’s ecosystem healthy and clean, and it manages a visitor's center and a wooden boardwalk that stretches a good way over the swamp at the south end of the lake. The lake is a natural rookery where a huge number of shore birds and migratory songbirds nest every year. A large number of alligators also live in the lake and can be observed from Rookery Road along the edge of the water. Cane River Lake is a 35-mile long and up to 250 feet wide oxbow lake in Natchitoches Parish, Louisiana, and it is a portion of the Red River. 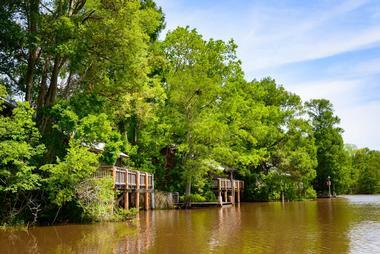 The lake runs throughout the historic Natchitoches district and is surrounded by many large plantations. The most famous is Melrose or Yucca plantation. The lake was created by a natural dam formed by a large log jam. This beautiful, narrow, meandering body of water is very popular among fishermen and is great fun exploring in a kayak or canoe. Surrounding banks are dense with greenery and large trees, teeming with birds and wildlife. Caney Lakes Recreation Area is located north of Minden in northwestern Louisiana. The area has two lakes – Upper and Lower Caney, which together cover 350 acres. Lower Caney is bigger, more popular and much more visited. The area forms a part of the Kisatchie National Forest, which offers plenty of opportunities for hiking, bicycling, camping, picnicking, swimming, fishing, boating, water skiing, and hunting. The area is surrounded by green wooded hills, and the shoreline, which is easily accessible,, is intersected by a number of hiking trails. The most popular is the Sugar Cane National Recreation Trail, which winds around Lower Caney. There are still working cotton plantations around the lakes. The lake occasionally becomes overgrown with the imported and invasive Giant Salvinia fern, which tends to choke the lakes and reduce their water level. Cross Lake is the 8,575-acre freshwater reservoir near Shreveport in Northwest Louisiana that supplies water to Shreveport. Forests of ancient cypress trees and wetlands surround the lake in some areas, but many areas are heavily developed with private residences. The lake was created in 1926 after the construction of Cross Lake Dam and its Spillway, which took over Cross Bayou. It is very popular with fishermen for its excellent bass fishing opportunities. There are frequent local and national fishing tournaments on the lake. The fishing rule in the area requires fishermen to release any bass they catch that measures between 14 to 17 inches. The most common fish in the lake are bass, catfish, blue gill, white perch, and red ear sunfish. No fishing is permitted less than 100 feet from a boat dock. Boating on the lake is great, and swimming is also allowed, though it is risky since there are alligators in its waters. The lake borders Ford Park and Richard Fleming Park. False River is a 3,200-acre lake near New Roads about 35 miles from Baton Rouge. This oxbow lake was formed in the early 1700s from the Mississippi River. 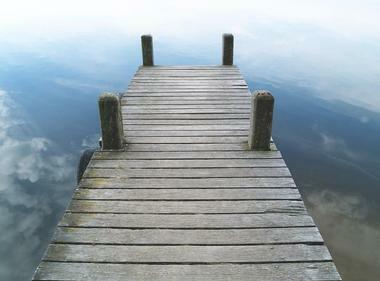 The lake’s average depth is 21 feet, and its maximum depth is 65 feet. Its shoreline is heavily developed with private residences, camps, and various businesses. Visitors come to the lake for hunting, angling, water sports, and rest and relaxation. The lake’s fish population and its diversity are seriously affected by sedimentation, poor water quality, various fish diseases, and overgrown vegetation. There are efforts underway to improve the lake’s water quality and invasive plant proliferation, and the lake’s fish stock is carefully monitored. Henderson Lake, located close to Rocky Branch and Loch Lomond, is a gateway to the Atchafalaya Basin. A combination of open water and picturesque cypress swamps, the lake is home to over 300 different kinds of diving waterfowl and other birds. It is wonderful for slow paddling, and you can see many small private cottages and houseboats on one bank and ancient cypress trunks on the other. While paddling, you can see large flocks of cormorants, sometimes 40 or 50, as well as Osprey nests high up on cypress trees. The trees are magnificent and covered in bright green Spanish moss. The launch site is paved and has large graveled parking area and Pat's Restaurant. Located about 20 miles from Leesville, Hodges Gardens State Park covers more than 700 acres of combined wild and cultivated spaces. Businessman A.J. Hodges Sr. opened it to the public in 1956, and it consists of a great diversity of plants and flowers. Depending on the season, you can see acres of blooming azalea or fragrant roses in the formal rose garden. The park was built within an abandoned quarry, and many rocks from the quarry were used in designing the garden. Flowerbeds were planted on different levels, creating a terraced effect. Numerous footbridges and walkways allow visitors to stroll through the park. There is also a 225-acre lake on the property that was built in 1954, and the water from the lake is used to water the gardens and supply a source for various waterfalls, pools, fountains, and a geyser. The lake is stocked with fish, and it is a great pleasure to sit on its bank and cast a line surrounded by so much beauty. Located about 25 miles from New Orleans, Lac Des Allemands is a natural 12,000-acre lake fed by many surrounding Barataria Basin bayous, including Bayou Chevreuil and Grand Bayou. The basin is full of bayous, drainage canals, access canals, and navigation channels. 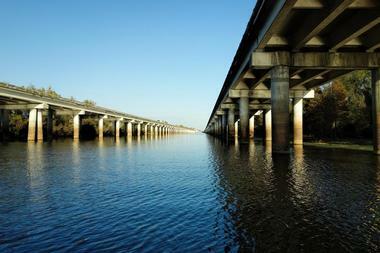 The main channels are the Barataria Waterway and the Intracoastal Waterway. Lac Des Allemands is a very shallow lake, reaching a maximum depth of 10 feet, but it is on average only five feet deep. It is 5.5 miles long and 6.5 miles wide. Lac Des Allemands, with its canals, bayous, cypress swamps, and fallen trees, are ideal for fish, and the lake has been justifiably named the Catfish Capital of the World. There are numerous fishing camps on the lake's shoreline. Besides fish in the lake, cypress-lined bayous provide home to raccoons, otters, egrets, frogs, great blue herons, alligators, and bold eagles. Lake Bistineau, a narrow reservoir covering 15,550 acres, is located in northwestern Louisiana and is connected to the Red River and eventually to the Mississippi. Bistineau was created in 1800, after a huge log jam in the Red River flooded several thousand acres of land. The lake started to drain after the area was successfully dredged. The lake as we know it today was created after a permanent dam was built across Loggy Bayou. Clyde Connell, an abstract impressionist painter who lived in a cottage by Lake Bistineau, has immortalized the lake. With an average depth of seven feet, the lake occasionally suffers from proliferation of giant salvinia ferns that tends to choke up the waterways. Lake Bistineau State Park was established in 1938 and provides visitors an opportunity for boating, fishing, hiking, and biking, and it has numerous playgrounds, two boat launches, and a number of camping cabins. Lake Bruin is a 3,000-acre ox-bow lake in northeastern Louisiana formed by the Mississippi River. Its clear water is wonderful for swimming, boating, and fishing. Part of the lake is within state-owned Lake Bruin State Park, but most of the land by the lake is privately owned, and the banks are dotted with many luxurious homes as well as piers that extend into the water. The 53-acre park was established in 1928 as a fish hatchery. 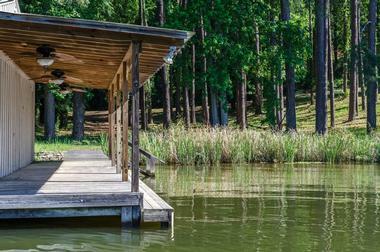 The park has three big fishing piers, a boat launch, and a boat shed. There are plenty of boats for rental. Fishing for largemouth bass is the most popular activity, though there is also crappie around the piers and bluegill fishing in the shallower waters. Visitors will find barbeque grills and picnic tables in the park near the lake and next to two of the fishing piers. Lake Chicot, a 2,000-acre man-made lake located in the heart of Chicot State Park, is stocked with crappie, bass, bluegill, and red-ear sunfish and surrounded by green rolling hills. 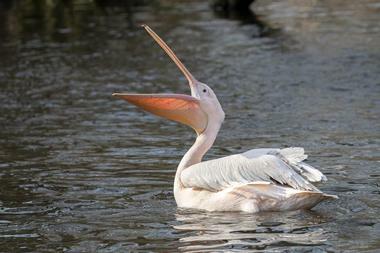 Chicot State Park is a 6,400-acre wildlife reserve located near Ville Platte, South Central Louisiana. The park offers pavilions, fishing boat rentals, barbecue pits, picnic areas, simple campsites, lodges, and cabins. Visitors may encounter a number of wild animals in the park such as whitetail deer, coyotes, raccoons, and bobcats. 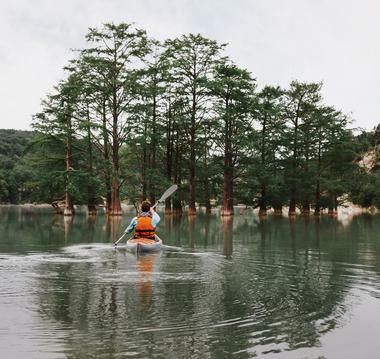 The lake’s clear waters are perfect for canoeing, kayaking, and fishing. 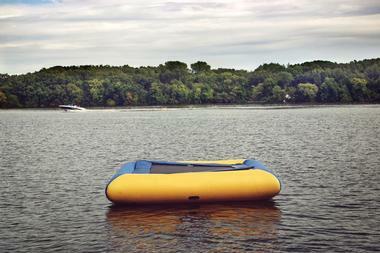 There are three boat launches and several boat rental facilities. A scenic hiking and backpacking trail winds around Lake Chicot, and it has several basic campsites along it. Lake Claiborne is located only five miles from Homer, Louisiana. The U.S. Army Corps of Engineers created this 6,400-acre reservoir by impounding a small tributary of the D'Arbonne River in 1970 with the Claiborne Dam and Lock. The reservoir, which is fairly isolated, was originally created for navigation and water management. 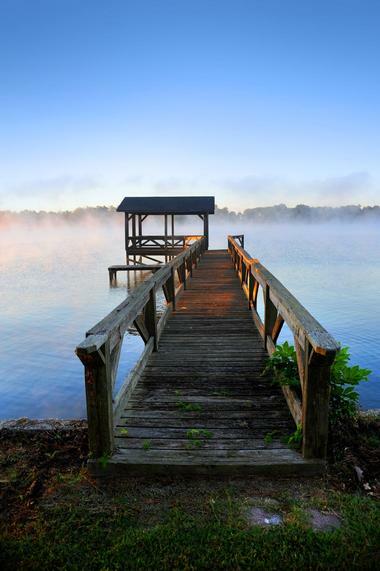 Lake Claiborne is a very popular vacation destination for people who love fishing, boating, swimming, hiking, water skiing, camping, and bird watching. It is called Louisiana’s "Most Scenic Lake." The waters are stocked with largemouth bass, catfish, bluegill, crappie, hybrid stripers, chain pickerel, and walleye, and some of the largest Louisiana striped bass have been caught in the lake. There are many boathouses with a fishing pier around the lake and two boat ramps. Lake D’Arbonne is 15,250-acre man-made reservoir located near the town of Farmerville in north Louisiana in a quiet, isolated rural area. The lake was created in 1963 and is surrounded by Lake D’Arbonne State Park. The park is a popular place to hike, camp, fish, and watch nature. There are 58 campsites, 16 cabins, and two lodges. A network of hiking trails weaves throughout the park, with the four main ones marked as Orange, Green, White, and Blue. Boats and canoes are available for rent by the day or hour. There is also a tennis court, and Lake D’Arbonne State Parke is the only State Park in Louisiana that has one. Mixed hardwood and pine forests are teeming with wildlife. Lake Fausse Pointe State Park is located about 18 miles from St. Martinville in Louisiana, next to the Atchafalaya Basin. 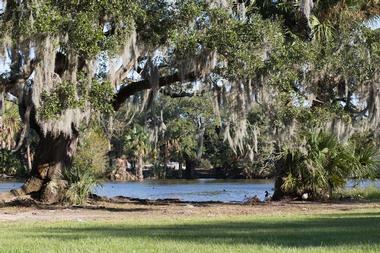 The Chitimacha Indians once populated this lovely 6,000-acre park. It has a boat launch, splash park, playground, pavilions, picnic area, restrooms, numerous nature trails, and marked canoe trails. There are also simple campsites, 18 cabins, and 50 RV campsites. The park is full of wildlife, including raccoons, whitetail deer, black bears, cottonmouth snakes, alligators, armadillos and bobcats. 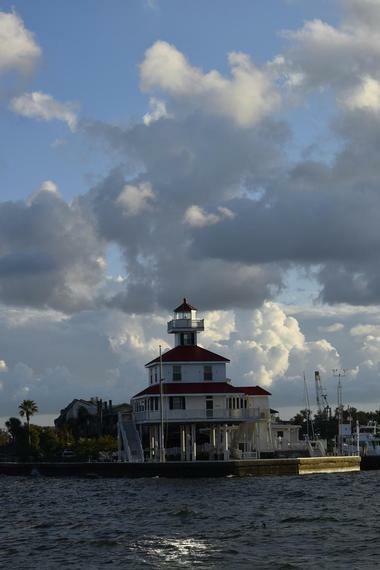 There is an interpretive center that offers detailed information and various exhibits about the park plants and animals, and it provides a boat launch and dock for kayaks, canoes, and other small boats. There are three major hiking trails that allow biking as well. Numerous canoe trails are well marked and offer access to several basic canoe campsites. Calcasieu Lake is a 49,156 acres lake located about 17 miles from Lake Charles in Cameron parish, which is situated in southwest Louisiana. This brackish lake, also called Big Lake, opens to the Gulf of Mexico, explaining the water’s salinity. The salinity of the lake water also accounts for the large amount of fish, inviting anglers to search for record redfish, speckled trout and flounder. Many fishermen go home with seven-pound speckled trout all over the estuary. In 2007, the local fishing guide saw an albino bottlenose dolphin, which was named Pinky because of its pale skin color. There are a number of boat and fishing charters organizing fishing and nature observation tours. Lake Pontchartrain is a 630-square mile estuary in southeastern Louisiana. Its average depth is about 12 feet, but there are deeper shipping channels that are constantly dredged to ensure safe navigation. The lake was formed some 2,600 to 4,000 years ago when the Mississippi River Delta’s alluvial deposits created its eastern and southern shorelines. The lake is linked to the Gulf of Mexico through the Rigolets strait and Chef Menteur Pass through the Lake Borgne. 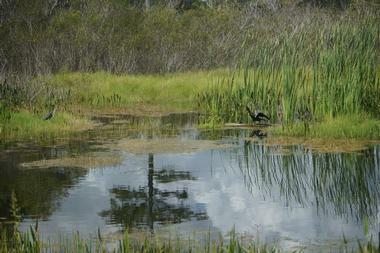 It is one of the biggest wetlands on the North American Gulf Coast. The wetlands cover over 125,000 acres and include cypress swamps and bottomland hardwoods as well as mixed herbaceous wetlands and marshes. Once a popular retreat for wealthy New Orleanians, the area is today full of artists and young professionals seeking escape from urban life in the beautiful Victorian mansions with spectacular water views of the lake. 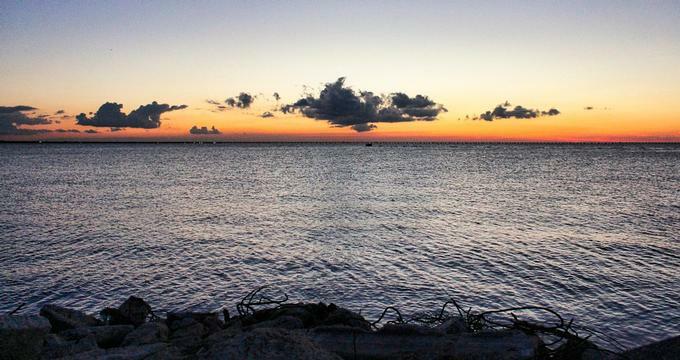 There is a 24-mile-long causeway that crosses Lake Pontchartrain and brings travelers from New Orleans to a world of tranquility and long trails through woods and wetlands. The lake’s north shore is full of luxurious accommodation, quaint B&B's, famous restaurants, and galleries. Poverty Point Reservoir State Park is located in Richland Parish in northeastern Louisiana along a 2,700-acre man-made reservoir that was named after nearby archeological site Poverty Point. Native Americans inhabited the site between 1,400 and 700 BC, which now has a number of earthworks and other artifacts. The park has 12 cabins and 54 campsites and offers diverse opportunities for watersport activities, hiking, swimming, and fishing. 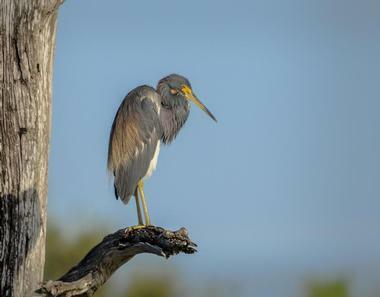 The region is part of the Mississippi Flyway for many species of birds, providing visitors with a fantastic opportunity to observe large numbers of bird species such as cormorants, ducks, bald eagles, geese, and pelicans. Fishing is also popular, and you can find a 48-slip marina, fish cleaning station, boat launch, and concession area. Fishermen come for largemouth bass, blue gill, black crappie, and channel catfish. There is a half-mile hiking trail near Bayou Macon, but black bears that live in the area make it hazardous. Toledo Bend Reservoir is located on the Sabine River between Louisiana and Texas. The 185,000-acre lake is the largest man-made reservoir in Texas. The dam can produce 92 megawatts of electrical power. Toledo Bend has 1,200 miles of shoreline and is being rapidly developed as a recreation spot. There are already many opportunities for swimming, boating, various picnic areas, camps, and hiking and walking trails. Freshwater fishing is very popular, and a number of clubs host annual tournaments. While there are a number of marked boat lanes, there are still many submerged logs and tree stumps, so shallow draft power boats are the most suitable.